Governor Terry Branstad, a man who has won six statewide races in Iowa, was asked for a little political analysis this morning at the end of his weekly statehouse news conference. When pressed about Perry’s treason comment, Branstad talked about the gold standard. New Jersey Governor Chris Christie just told a small group of reporters in Des Moines he may endorse a 2012 Republican presidential candidate. AUDIO: Full exchange about the presidential race, which starts at the 11-minute mark. 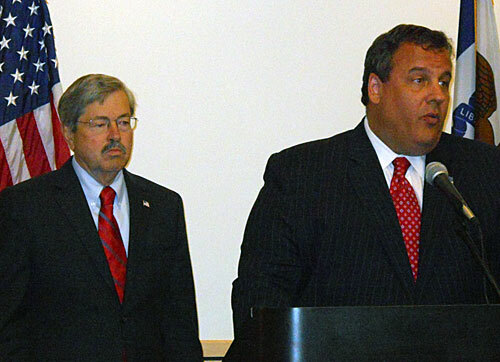 Christie was in Des Moines to give a speech at Governor Branstad’s Education Summit. He’s headlining a fundraiser this evening for Congressman Steve King. Twice during the news conference Christie said he had come to Iowa at Governor Branstad’s invitation rather than his own initiative. Christie was asked if he had gotten any encouragement “during your short trip here” that would make him change his own mind about running for president in 2012. “I don’t think there’s anything in particular that has happened since I landed here,” Christie paused to look at his watch, “about an hour and a half ago.” He was also asked about 2016. Neither Iowa Lieutenant Governor Kim Reynolds nor Governor Terry Branstad will attend Texas Governor Rick Perry’s “Day of Prayer and Fasting” in Houston on August 6. The top two leaders of the Board of Regents — the nine-member board which governs the University of Iowa, Iowa State University & the University of Northern Iowa — have submitted their resignations. Republican Governor Terry Branstad had asked Regents president David Miles to resign so he could appoint his own person to lead the board. Miles resisted, but has now resigned. Iowa Board of Regents rather than serve out my statutory term to April 30, 2012. A couple of days later he made the same request of president pro tem Jack Evans. Jack and I visited, and because the president and president pro tem are elected to two year terms by the Board and do not serve at the pleasure of the Governor, we respectfully declined to act on the Governor’s unprecedented request. We believe this to be an important principle.